John P. DeGrazio followed his passion on a career path to become a wilderness guide in Yosemite National Park. He has shared many successful journeys with visitors along the trails of Yosemite since YExplore was established in 2006. John has realized his professional purpose through these experiences covering thousands of miles among the most scenic terrain in the world. Reaching a summit with a team brings a satisfaction that lifts our spirits and strengthens our core. However, one does not need to climb a mountain to feel that ultimate sense of victory. Success is achieved with every outdoor adventure that helps us choose an extraordinary new path in life. DeGrazio has spent the last decade cultivating his professional career as motivator, coach, naturalist, and wilderness guide. John has shared stories of the geological, natural, and human histories of Yosemite National Park and the Sierra Nevada with visitors from across the globe. Along the way, he has assisted in authoring new narratives while helping others accomplish their goals. John has guided over 160 successful ascents of the Half Dome cables where he blends enthusiasm with a patient approach to coaching that provides assurances to his groups when they need it most. DeGrazio also takes great pride in leading visitors into Yosemite wilderness where they may hike in snow for the very first time, wander through meadows carpeted with wildflowers, witness a mother bear and her cubs in their natural habitat, or listen to a melodious chorus of native birds. It is his belief that these unique experiences in nature lead to a process of self discovery that empowers people who seek fulfillment. As a Certified Wilderness First Responder, John P. DeGrazio has received extensive training to provide added safety on every trip. He is also a Leave No Trace Trainer who relishes his role as a steward in Yosemite and enjoys teaching principles of minimum impact recreation while accessing the park’s most pristine places. John and YExplore were recognized by the Cystic Fibrosis Foundation Northern California Chapter as the recipient of their 2017 Volunteer Award. In his spare time, John has a passion for hiking, photography, backpacking, and rock climbing in the Sierra with family and friends. He also enjoys visiting other national parks with his family. He has shared ascents of Half Dome and Angels Landing in Zion with his daughter Mia before her tenth birthday. For his one hundredth summit of Half Dome, he climbed the Snake Dike route. DeGrazio has also led successful ascents of Mt. Whitney (14,495′), the highest peak in the lower 48 United States. In 2018, John achieved the 19,341 ft. summit of Mt. Kilimanjaro, Africa’s highest peak and one of the Seven Summits. Other interests include playing competitive softball and road cycling. You may spot him hammering through some of the Gold Country foothills at any time throughout the year. John strongly believes in community service and volunteers his time at several different schools and local organizations in and around Yosemite. 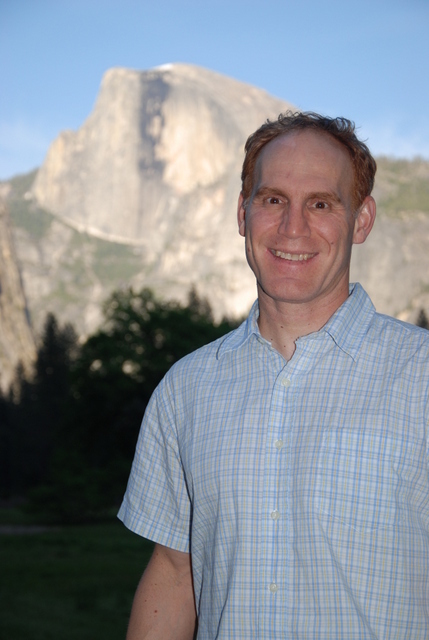 He is a Past President of the board of directors for the Yosemite Gateway Partners. John’s latest project is the Yosemite Can O Peaches Radio Show for a local community radio station in Sonora. He is the creator and host of the show whose purpose is to share stories and sweet rewards from Yosemite personalities with listeners from across the globe. John P. DeGrazio’s dedication to stewardship in Yosemite National Park earned him recognition as a Yosemite Centennial Ambassador in 2016. It is his esteemed honor to represent Yosemite during the National Park Service Centennial Anniversary and beyond. YExplore has also established a discretionary account with Yosemite Conservancy to donate annually to the Yosemite National Park Bear Management Team.